www.johnseed.com: Robert Neffson: "The City Reflects Us"
Robert Neffson, whose views of New York City, London, Paris, and Venice are on exhibit at Bernarducci Meisel Gallery through April 28th, is considered a Photo-Realist. However, that particular stylistic label doesn't quite describe the full range of his aesthetic ambitions. Neffson's richly detailed canvasses are meant to go beyond realism and connect each viewer with a range of perceptual and intellectual experiences. He characterizes his work as being "... about how my body, mind and memory move around and inhabit the spaces I love." A disciplined craftsman who takes 3 to 4 months to complete a painting, Neffson laments the general suspicion that often greets the work of Photo-realists: "My accuracy, preciseness, even 'labor' are sometimes viewed suspiciously, somehow not as art or people think there must be some trick." Neffson is a Humanist whose artistic heroes -- especially Canaletto and Richard Estes -- employed detailed city views as metaphorical maps of human ambition and experience. "A city is made up of people and the traces of their hands and minds," Neffson observes, "the city reflects us and we are a part of it." To be a Photo-Realist in 2012 means going against the art world's current polarized notions of what a work of art should "feel" like: bracingly theoretical or obviously emotional. In the opinion of many critics, Photo-Realism can look like a an exercise. "...most of the Photo-Realism," commented art historian Peter Selz in his 1997 book 'Beyond the Mainstream,' is tour de force painting -- it shows what a painter can do by using photographs. But once you get over the fact -- 'my god, isn't it remarkable how he managed to do this' -- it isn't all that exciting." For anyone who feels that his work is short on feeling, Neffson offers a rebuttal: "The art world is very confused right now and it romanticizes crudeness, awkwardness and ineptitude, which it mistakes for expressing 'real emotions.'" As his artistic rejoinder Neffson offers up paintings which are both panoramic and personal. 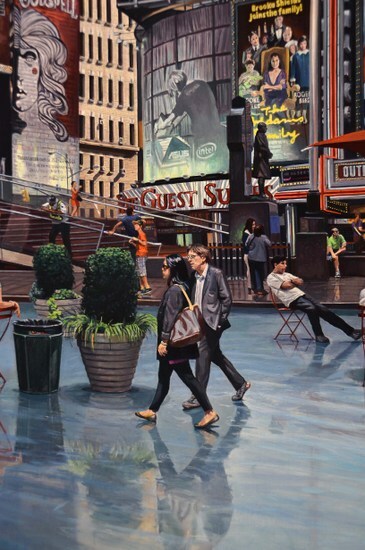 In his vivid "Times Square" (2012) Neffson includes himself and his wife Karin walking through the painting's middle ground. "All art has an aspect of self-portraiture in it anyway," notes the artist, "why not literally include yourself in it? Above: a detail of Neffson's "Times Square" shows the artist and his wife Karin. When Neffson doesn't literally paint himself into a city scene, he finds other ways to make himself present. One way he does this is to make slight adjustments to each scene -- playing with weather and reflected lighting is one specialty -- and he also thinks through his paintings in myriad ways. "At times," he comments, I think like an architect, city planner, landscape and lighting designer, meteorologist, movie and theater director, psychiatrist, philosopher, novelist, poet and so on..."
Considering the artist's attentiveness and intellectual flexibility, it isn't surprising that a close inspection of his works results in the discovery of charming details. In "Vaporetto," a view of Venice as seen from a water taxi, the tiny reflection of Santa Maria Maggiore in the boat's windows, is one example. At the heart of "Times Square" a flock of visitors sit, chat and slouch amidst a small forest of Broadway posters. It is a gallery within a gallery, along the lines of Watteau's "Shop Sign of Gersaint." Neffson's tendency is to hold up vignettes from the leading cities of the United States and Europe and show them as the places he wants to inhabit, while at the same time beckoning us to do the same. They are in the tradition of vedute; lovingly detailed travel pictures that touch on our pride in cities and their potential. I spoke to Robert Neffson about his artistic intentions and asked about his tendency to idealize his images. JS: If someone were to criticize one of your paintings and say that it didn't have enough social reality how would you respond? RN: My interests and gifts are aesthetic ones directed towards a search for the sublime or the beautiful. I also am open to the hard-edge truths of the city and they become a part of my vision. There are many painters who do social commentary but my work goes in a different direction, its about something else. So to criticize them as not having enough social reality would be to miss their intention. JS: Is it fair to say that something you do as an artist is to idealize cities and show us their potential? RN: The paintings are made with great respect to the ordinary and how everyday things look . They combine elements of reality in order to explore non verbal emotional states. The city becomes a metaphor and I use people, buildings and natural landscape to create a mood that corresponds to inner feelings I have. Through this process they reach for an ideal. An artist's work is a reflection of his view of the world and who he is. In an indirect way, I try to show my own potential and that of the city. This happens naturally through my search for an image I can live in as I explore the structure of visual forms. JS: In some way, does your work attempt to "heal" cities, and show them as more perfect than they actually are? RN: I start out looking for a private "perfect moment" that will transcend just the personal. Its about a transformation of transient reality into something permanent , ordered and as expressive as possible. If along the way people can get a sense of another way of life and how things could be, I am greatly gratified. I grew up in a small quiet suburb outside the city. So seeing the disenfranchised and eccentrics in the inner city, I was slightly scared of the alienness but a little attracted to the strangeness and possibilities of other ways of being. When I was 6 my Mom's death changed the world for me and I turned toward art. 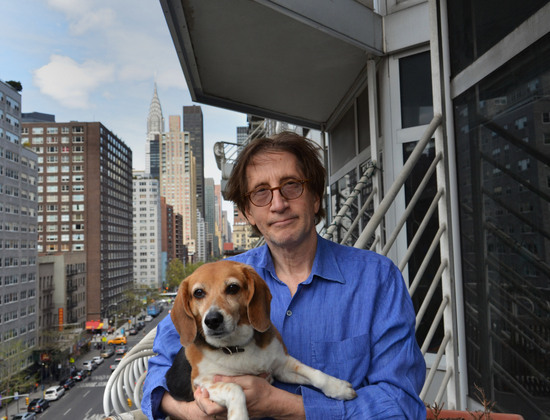 My family had scientists and artists so I was interested in both disciplines. Art was a way of exploring reality and my place in the world. It always has a combination of realism and romantic idealism to me. I wanted to live in Manhattan, so I painted it and now I live here. Part of my interest in art is to heal myself not the city but perhaps in some sense it comes out that way.